There may have been Easter bunnies out over the weekend but spring was not in the air with another cold snap coming in from the north west. However there was plenty of athletics action and Wesham members were out in numbers. Good Friday saw the top quality Salford 10k take to its two laps of the streets and Rob Danson was 6th in a fast 31:06. David Taylor finished 67th in 35:43; Lee Barlow was close behind in 84th and 8th M45 in 36:24. Alex Rowe completed his first 10k in 18 months of knee problems finishing 180th and 5th M60 in 39:54. Tanya Barlow was 99th woman and 16th W45 in 50:31, placing 419th overall. The Caldervale Country 10 mile race was also on Good Friday with a new earlier start time. Paul Hetherington finished 10th and 3rd M40 in 1:04:58 over the hilly course circling though Oakenclough. Paul Gregory was 23rd and 7th M40 in 1:08:12. Simon Denye placed 46th and 13th M40 with 1:15:01. Helen Lawrenson was 9th woman and 60th overall, 2nd W45 with a time of 1:16:59. Thomas Farquhar finished 88th in 1:21:27; Ben Wrigley was 112th in 1:26:31; Fran Hodskinson finished 54th woman and 15th W45 in 1:37:40; Elizabeth Johnson was 55th woman, 16th W35 and 172nd overall in 1:37:40. Finlay McCalman came in 179th and 20th M50 although credited as a woman, with 1:38:49. Diane Blagden was 71st woman, 9th W50 in 1:41:43. There were 226 runners in this popular event. Kim McGuire finished 25th in the new 5km race in 21:47. In the opening race in the 2018 Curly’s Trail 5km series in Horwich on Wednesday evening Steven Gore finished 9th with 21:12. Martin Bates was 58th and 3rd M60 in 26:28 and Vicky Gore was 24th woman, 6th W40 and 88th overall in 29:41. In the opening event in the 2018 series of the Lakeland Ultimate Trails George Helm ran in the Cartmell Sport Trail 5km, finishing 47th in 44:30, the 10th Under 16 competitor. Kellie Helme was 68th and 14th Lady Veteran 40-49 in 47:26. Julie Rooney ran the Trail Run 10km, finishing 167th woman and 502nd in 1:29:15. Sue Rigby was 168th woman and 503rd with the same time. In the 10km Trail Challenge, staged for the less competitive runners, Carl Groome finished 10th and 5th M50-59 in 1:35:23. Carl’s time would have placed him 38th in the Trail Race. Anne Berry was 47th woman and 237th and 10th W50-59 in 2:16:09, Finlay McCalman 347th and 47th M50-59 with 2:30:05. Simon Eaton ran the 18km Trail Race finishing 161st in 2:00:38, 44th M40-49. None of the courses are publicized. The Dentdale 14-mile race was won this year by returning Wesham member Steve Littler in 1:22:28 and good to see him back in competition. Blackpool local Paul Muller was 14th in 1:31:12. 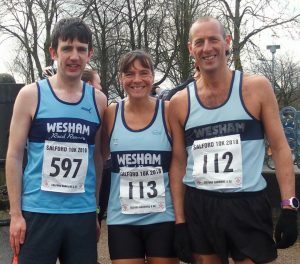 There were no Wesham members running despite its popularity with 420 finishers. Wesham had a parkrun take-over at Lytham Hall as their first Couch to 5k programme for 2018 reached its fulfilment. David Taylor lead the way with the fastest time of the morning with 17:49 just 8 seconds short of his personal best for the course with an age graded performance of 72.78%. Arran Galvin ran 18:51 for M35 70.82% and Carl Groome 19:32 and M45 74.91%. Alex Rowe dipped under 20 minutes with 19:55 for M60 80.50%. Lee Nixon scored M35 60.87% with 21:56 and Dave Marsland 22:12 for M60 73.50%. Rob Wallace ran 22:49 with 56.54%; Kay Twist 24:54 for W45 65.73%; Rob Danson 25:37 with M50 59.01%; Pauline Eccleston 27:24 with W45 59:12%; Ben Wrigley 27:47 and M35 48.05%; Nick Carter 28:18 and M40 48.59%; Gemma Owen 28:19 (W35 53.15%); Lee Barlow pacing one group to 28:33 for M45 50.03%; Jason Blagden 28:49 (M45 49.57%); Sharlan Butcher 29:34 and W40 53.21%; Clare Belfield 31:24 and W35 47.77%; Fran Hodskinson 32:01 (W45 51.74%); Ann Knowles 33:36 (48.21%); Maureen Danson 33:36 (W50 50.50%); Stephen Twist 35:07 (M50 42.34%); Julie Topping 35:16 (W45 45.94%); Michael Hall 35:21 (M40 39.51%); Alison Lincoln 35:23 (W40 43.24%); Tanya Barlow pacing at 35:31 with W45 45.14%; Shellie Bee 35:38 (W40 43.17%); Helen Lawrenson on pacing with 35:42 (W45 45.85%); Julie Rooney 35:46 (W40 43.66%); Stuart Topping 36:00 (M45 40.0%); Linda Williamson 38:13 (W45 41.56%); Emma Davies 38:15 (38.69%); and Sue Rigby 45:11 (W40 34.82%). Robert Brown ran the Preston parkrun and clocked 25:22 for M60 63.21%. Graham Cunliffe was out at his local run at Hyndburn and posted 28:41 for M60 56.42%. Martin Bates was out travelling again and took in the Penrhyn Castle parkrun near Bangor North Wales clocking 23:54 for M60 67.71%. The Gores were in Stratford-on-Avon for a cultural break and Steven ran 26:48 for M35 49.50% pacing Vicky to 29:51 and W40 57.73%. In the Blackpool parkrun on Stanley Park Stephen Browne had 23:10 for M50 64.68%; Sean Murray ran 24:05 for M35 54.74%; Kath Hoyer a first timer run of 24:33 for W55 75.76%; George Kennedy 25:27 with M60 63.00%; and Dave Waywell 30:40 for M70 59.84%.